Just look at this stunning capture at Dover Hall. The one thing that I can always count on when being a Wedding Photographer for Dover Hall, is that there will never be any shortage of amazing places to capture one of a kind images. 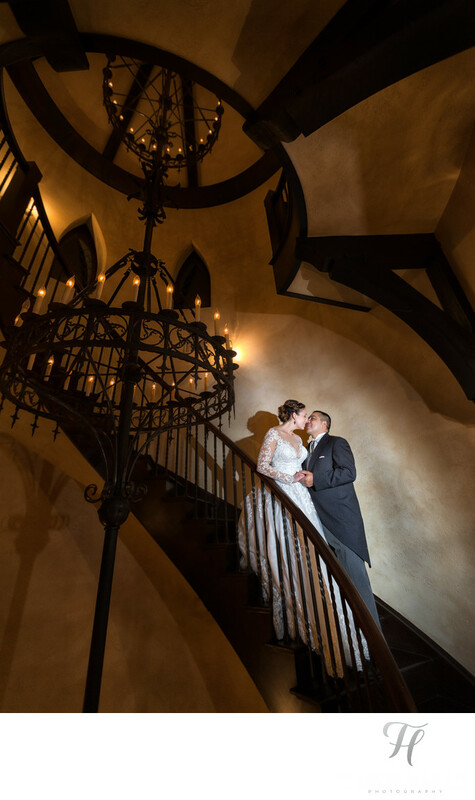 This image was shot on one of many winding staircases all throughout the mansion. I was actually on my dinner "break" and walked by this location at night, and decided to go and get my clients for "one more shot". They got up, and came with me. I sent my assistant Jorge up the stairs with one of my off camera lights, and after about three test shots I had the perfect exposure. I then took a second and "posed" them for the shot. I wanted a shot where they were not going to be looking at the camera (because it is too wide of a shot for that) so kissing made the most sense here. Clever huh! Next, I needed to be sure that Stella's arm had some bend to it, and was lightly resting on the railing. This allows a small pocket of space between her arm and body and this makes all the difference when it comes to a flattering figure. This was one of my fav. shots from this epic Dover Hall Wedding.